TIME calls Redding "weird" and says its citizens are so "obsessed" with kayaking that we're the unofficial capital of the paddle sport. If kayaking is weird, we don't want to be normal! Are Hawaiians weird for surfing so much? Are Coloradans weird for snow skiing? Are Parisians weird for eating croissants and baguettes? Nope. When you have the best resources - in Redding's case, beautiful, accessible lakes, a river that runs right through town, and 300+ sunny days per year - you're only weird if you don't use them! According to TIME, "Americans have always had strange obsessions, and how we interact online now gives us the ability to measure just how intense these interests are in different parts of the country. Meetup.com, a 12-year-old social networking site that allows people to organize gatherings around specific interests, offers just this opportunity." By finding the Meetup groups with the most members for a given activity in a single city, TIME determined the unofficial capital cities of hobbies like line dancing, ghost hunting, badminton, and of course: kayaking. Kayaking is nothing new to Reddingites and their visitors. Oak Bottom Marina at Whiskeytown National Recreation Area has offered kayak rentals for years, and the Whiskeytown rangers lead kayak tours all summer long, including some by full moon! It's not strange to see cars stacked with kayaks heading west through town to Whiskeytown Lake (only 7 miles away) or north to Shasta Lake, which has hundreds of miles of shoreline and as many inlets to explore. Manzanita Lake in Lassen Volcanic National Park, about an hour east of Redding, also beckons those who like a beautiful view and a quiet paddle. Or not so quiet - since kayaking is quickly gaining credibility as a family-friendly activity! For those who crave speed, the Sacramento River runs right through Redding, with several places to put in and paddle out, and you might as well bring your fishing pole. 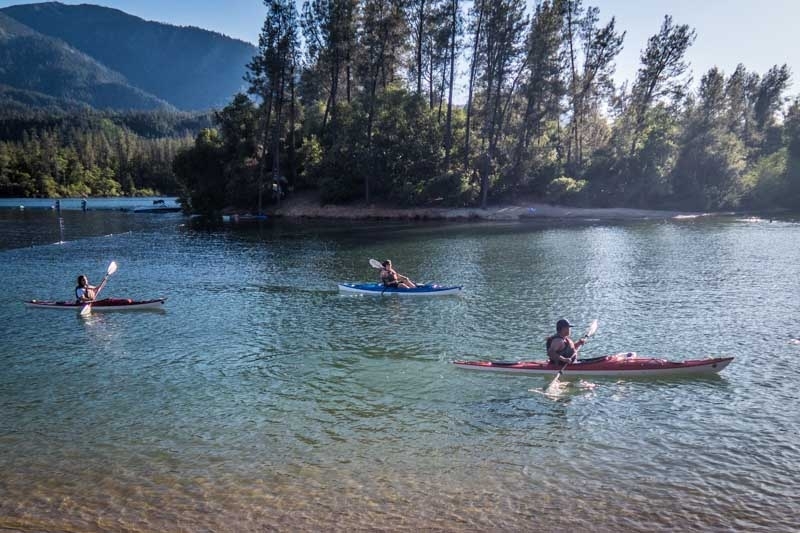 Redding's waters are so great for kayaking, it's the home base for the California 100, a paddling ultramarathon, and the Paddle California Tour, a four-day camping and paddling trip down the Sacramento River. If you love to paddle but would rather stretch your legs a bit, there are plenty of opportunities to Standup Paddleboarding in and around Redding. Standup paddling has its own following in town, with rentals and tours available for locals and visitors alike, and the California Paddle- a day of races and relays for all ages and abilities. So thanks, TIME, for calling us weird and making us the unofficial capital of kayaking! We'll gladly accept the honors. If you'd like to paddle around Redding, check out these local businesses for rentals, tours, and tips for getting the most out of your Redding visit.